Anew Nature has served hundreds of residential and commercial clients. across a wide variety of materials and design aesthetic. Designed and built for an entrepreneur and friend to Anew Nature, this standing height workstation is made of white lacquered steel, with concrete tube legs set atop a white lacquered base that neatly hovers above the floor. A pinwheel of walnut drawers opens to reveal 48 surge protected outlets and storage for additional cord length to keep this workstation clean and organized. A subtle, hand buffed lime finish gives this Northwestern Sugar Pine top a uniquely clean, but aged look. and features a spiraling, brushed steel base. The wood from this vanity came from the ruined slats of a broken bed. The owner of that bed was none other than Guy Long, one of Anew Nature's longstanding employees! 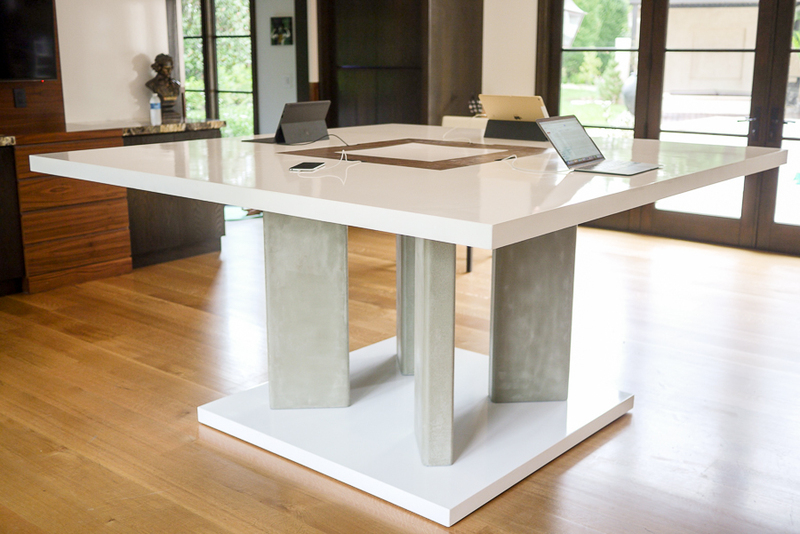 The design for this table is centered around the a beam of wood reclaimed from a theater in St. Louis city. It was commissioned by a couple from St. Louis after seeing a picture of the beam on our Instagram page. Comissioned by a courageous lover of modern design. This custom dining room table boasts flawless white lacquering, acid blackened steel and a central stripe of warm walnut. To start your journey, please complete the form below. You will receive an email with more information on how to commission your one-of-a-kind design.